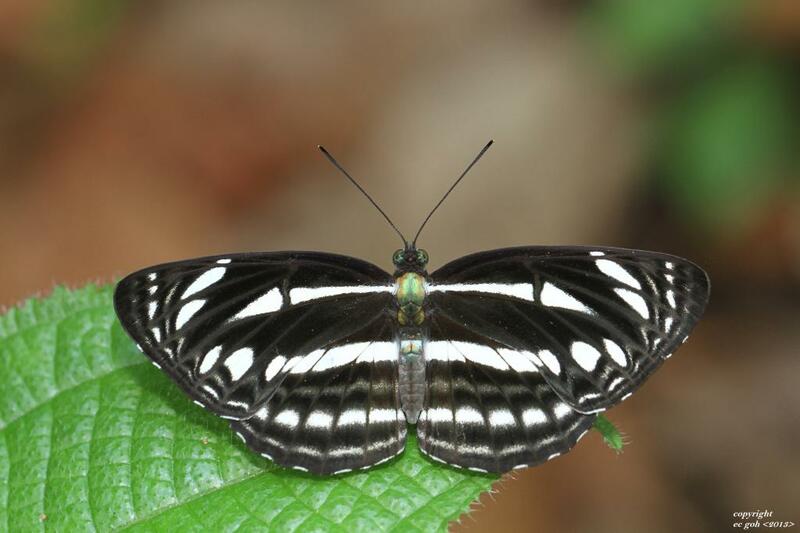 The Grey Sailor is predominantly a forest-dependent butterfly and is not frequently seen in urban parks and gardens. It tends to stay at forest edges and within the vicinity of forested areas and particularly where its caterpillar host plant, Gironniera nervosa is found. 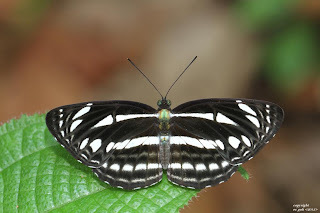 The typical black-and-white striped uppersides tend to get this species confused with two other lookalike species - the Common Sailor and Short-Banded Sailor. The underside of the Grey Sailor is white and grey, and serves to distinguish this species from the other two, which feature orange or orange-brown undersides. This pristine individual of the Grey Sailor was shot last weekend by ButterflyCircle member Goh EC along the forest edge near a park connector. The species is fairly common and can be quite skittish and uncooperative when a photographer approaches it. A good time to catch it distracted is when it is feeding on the ripened fruits of the Singapore Rhododendron (Melastoma malabathricum) or at flowering bushes.